We understand the challenges of running a business. This is why we created an effective project flow to ensure our clients’ vision can become reality in the most efficient way possible, while at the same time not sacrificing on design and creativity. We have developed a 3 phase design process to execute our projects. However we also know that every project is unique and clients may approach us for our assistance at any stage. As such our services are not only limited to the 3 phase process. We are here to listen and help our clients! 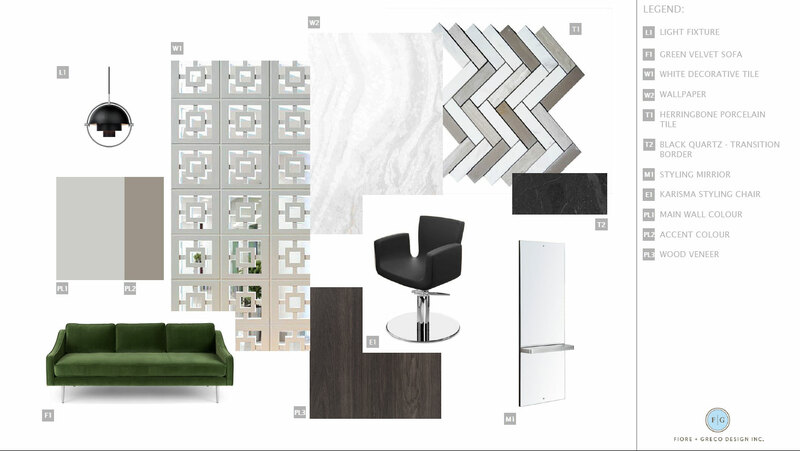 For our salon + spa interior designs projects we usually include the full design process. We maintain communication and continue to coordinate with clients and contractors from the beginning through to the end of each project. For more information about our services + pricing please contact us. 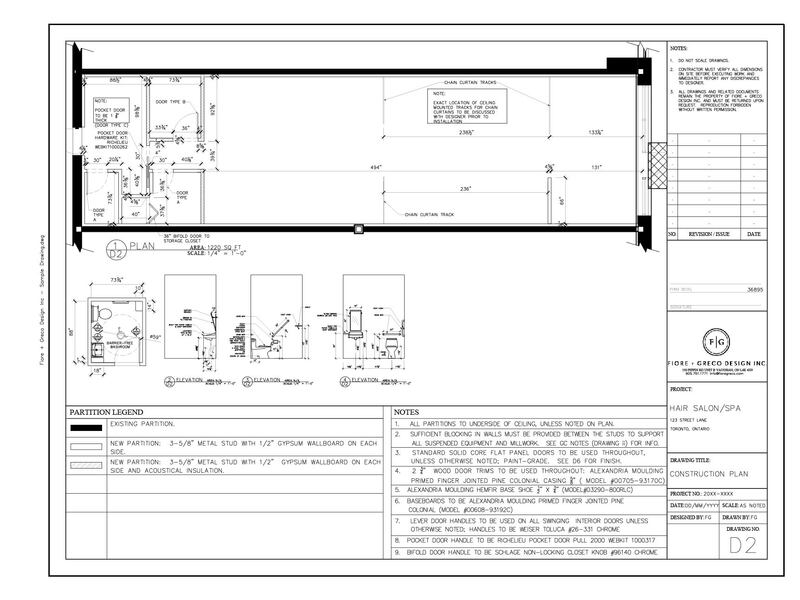 After your consultation, we will schedule a site measure to get your space into CAD and start from the existing layout. Then, based on the information we discovered from your first consultation, we create 3-4 floor plan options that include the services you wish to offer. A floor plan a scaled drawing that shows the different areas their relationship to each other, and gives an overview of where the walls, furniture, and fixtures will be. A floor plan is a great tool for showing what the flow of traffic will look like as people move throughout the finished space. We consider your wish list and business plan along with the square footage when creating a functional layout for your salon. On its own, a floor plan is insufficient to build from. Contractors typically need more information to prepare their estimates and schedules. 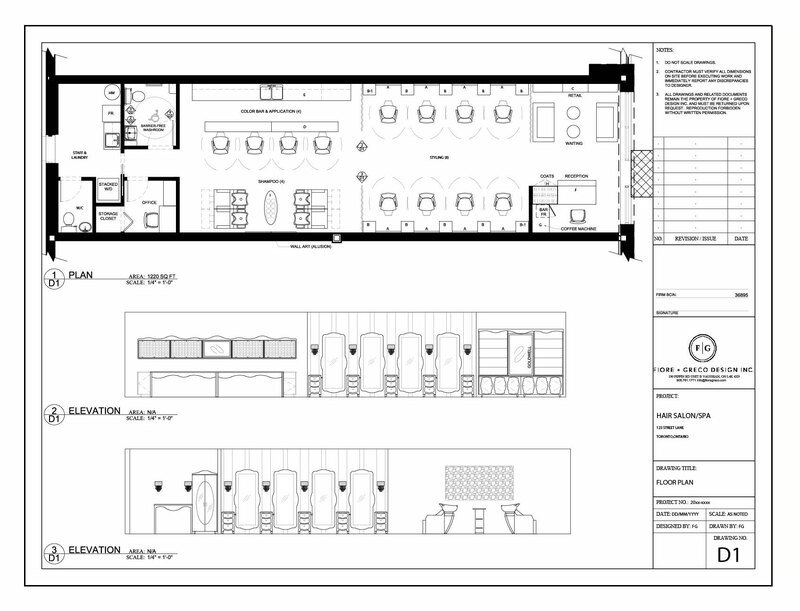 They require a full set of drawings that contain a lot more technical information than a floor plan does. Working drawings can include the demolition plan, construction plan, plumbing plan, power and data plan, and lighting plan. In addition, we have a specialized team of professional engineers who we provide the mechanical drawings if it your project requires them. These documents communicate the technical details of the build to your contracted professionals. The working drawings, along with Mechanical Engineer’s drawings are the minimum documents required in order to apply for permits, price, and build your space. The finishes plan indicates what flooring will be used, wall and ceiling finishes, plumbing finishes, millwork specifications, lighting specifications, and any other visual detail of your design. The location of finishes as well as their source will be indicated on a legend that is linked to your floor plan so that your contracted professionals can execute the plan. We understand that clients may find it difficult to visualize their design at this point, so we usually include a rendering to ensure you love your design and make any necessary adjustments before the work is completed.